Israel Prime Minister Benjamin Netanyahu was on course for a record fifth term after partial results from Tuesday’s parliamentary elections showed the veteran right-wing leader in front. Netanyahu and his main challenger Benny Gantz both claimed victory in the election. But exit polls and early results, with 80 percent of the votes counted, showed Netanyahu’s Likud with 38 seats, eight more than in the previous election in 2015, and Gantz’s centrist Blue and White Party with 36, the Knesset website and Israeli TV channels said several hours after polls closed. Earlier on Tuesday, Gantz declared victory before Netanyahu followed suit as two Israeli TV stations changed their forecasts and projected a narrow victory for Netanyahu. Addressing a jubilant gathering of supporters early on Wednesday, Netanyahu praised his supporters for an “almost inconceivable achievement”. “I was very moved that the nation of Israel once again entrusted me for the fifth time, and with even greater trust,” said Netanyahu before vowing to establish a right-wing nationalist government. “We won! The Israeli public has had its say!” Gantz’s Blue and White party said in a statement prior to Netanyahu’s speech. If Netanyahu wins, the 69-year-old will serve his fifth term in office, a record, and would become Israel’s longest-serving prime minister in the summer. 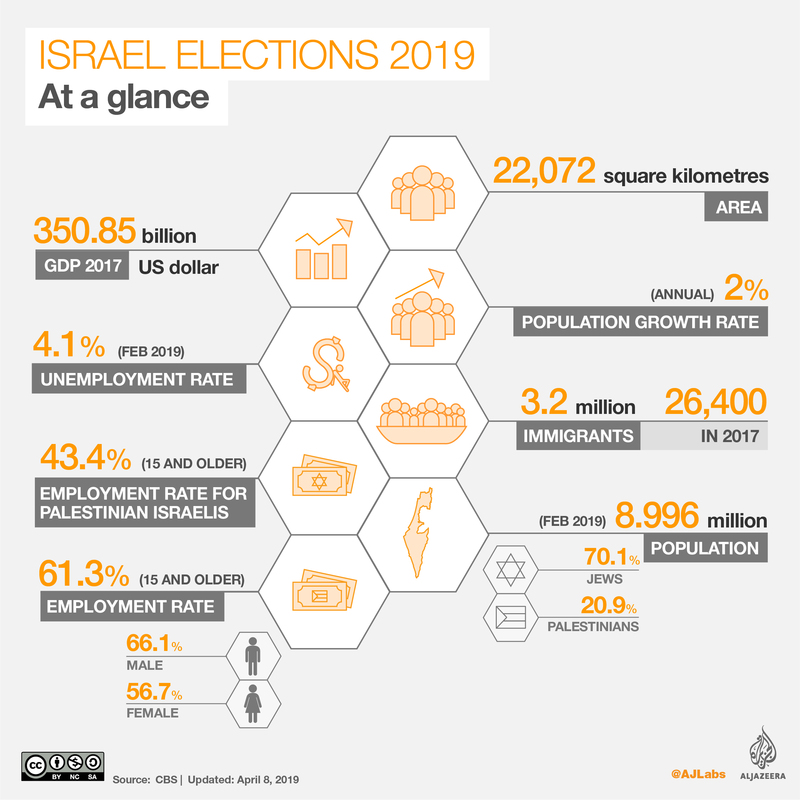 Al Jazeera’s senior political analyst Marwan Bishara said that based on all three exit polls, it is difficult to see how Gantz can form a government without Likud. “He probably could depend on the eight Labor party seats, the five Meretz seats and that will get him something like 50 seats. He already said he will not go into a coalition with Arab parties, hence the best he can do is some 55 seats and that’s not a majority,” Bishara said. Several smaller parties, including the ultranationalist New Right party and the Arab Balad list were on the cusp of securing the 3.25 percent of the vote required to enter parliament. The fate of the smaller parties could play a crucial role in deciding who ultimately becomes prime minister. Early projections also showed turnout among Palestinian Israelis was especially low. An hour before voting closed, Arab turnout was at 46 percent, well below the 61 percent turnout nationwide. Overall Arab turnout in the 2015 election was 63 percent. 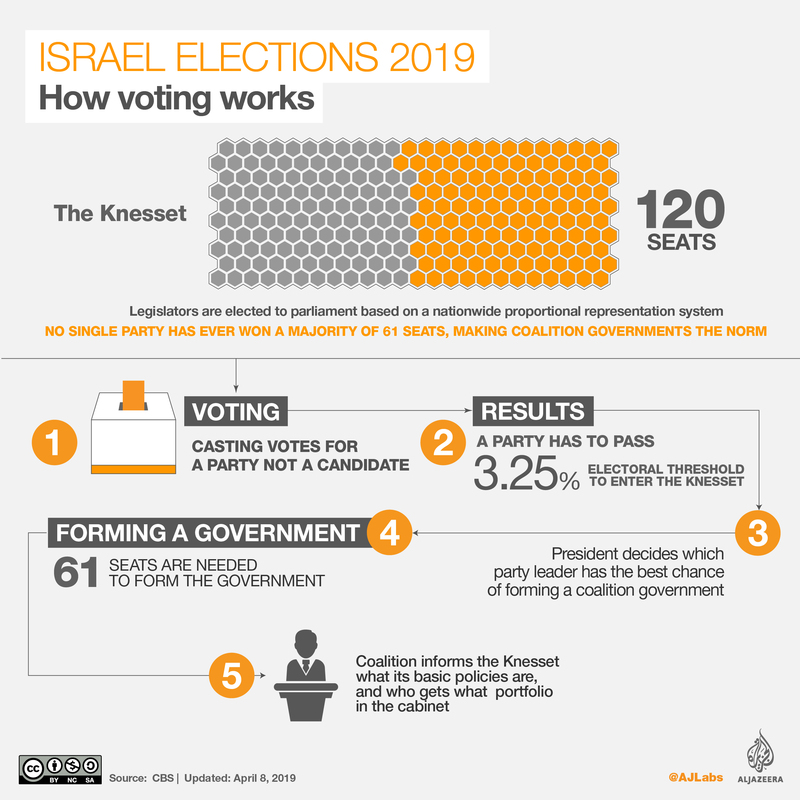 MK Ahmad Tibi, running as the second candidate on the Hadash-Ta’al list remarked on Twitter that the low voter turnout among Palestinian Israelis “constitutes a real danger to both lists”, a reference to the two separate Arab alliances running in the election. On Tuesday, Likud activists placed 1,200 hidden cameras in Palestinian polling areas, prompting the Central Elections Committee (CEC) chairman Judge Hanan Melcer to file a complaint to the Israel Police. Netanyahu responded saying there should be cameras everywhere to “ensure a fair vote”. They were subsequently removed. Meretz later submitted an appeal to Elections Committee to extend closing time for polling stations in Palestinian localities. A senior Palestinian official said that Israelis had voted “no to peace” after early projections showed its left-wing parties were badly defeated. “Israelis have voted to preserve the status quo. They have said no to peace and yes to the occupation,” Saeb Erekat said in a statement. Additional reporting by Mersiha Gadzo in Jerusalem.